That was a lot of blood! If you’re squeamish, do not scroll down or read further. The Bantam A team I’m helping out this season had a full-ice practice last night but only one goalie, so I threw on my pads and took a net. Aside from the incredibly tiring effort that it takes to face shot after shot after shot (repeat 150 times), it went well. I was too tired to drag my gigantic goalie bag into the house when I got home so I left it for this morning. This morning, around 9;45, as I was hauling my bag over the raised threshold of our front door, the plastic handle of the bag snapped. One sharp edge sliced a joint of my poor left forefinger. I dripped a considerable amount of blood into the sink while Elvi bandaged my finger with gauze and tape. That seemed to stop the bleeding, so we went to to brunch with my mom, who’s visiting this week. We got home before noon and I decided to check out the wound. Upon removing the tape and gauze, my finger started pouring blood again. I got Elvi to patch it back up and off to the emergency room I went. 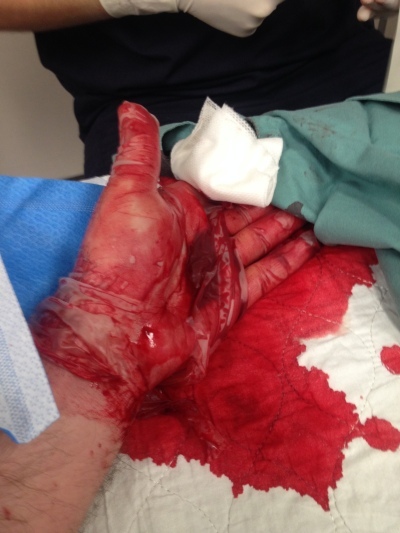 In triage, the nurse wanted to look at the cut. I told her to bring over a garbage can because I was going to bleed all over her office otherwise. Good thing she listened to me. A doctor finally saw me around 4:45. He took the triage nurse’s bandage off and, yes, blood started pouring out of my finger again. There was no way he could see inside the wound to check for damage or sew it up without stopping the flow of blood. The first thing he tried was to put my hand in a rubber glove and roll back the glove finger of my wounded finger so that the tight roll would form a sort of tourniquet. As you can see below, that didn’t work. What did work, finally, was using a strip of the rubber band normally used on the bicep for IVs. I would have a pic of that, but my phone ran out of battery. In all, I lost about half a cup of blood. That pool of blood in my palm inside the glove clotted into a cool jelly-like mass. 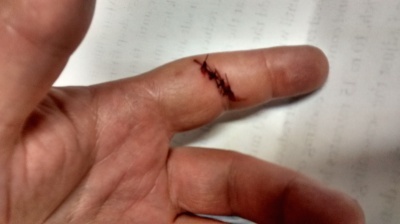 I have no tendon or nerve damage, but I do have four new stitches. I did almost throw up, but only after the doctor had finished all the sewing. There’s been surprisingly little pain after the original slice.